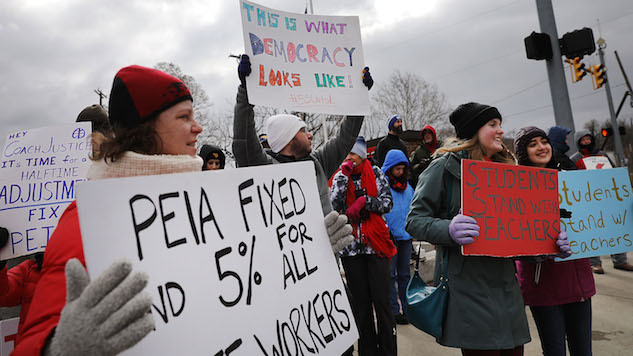 After a nine-day strike that kept West Virginia public schools closed, the West Virginia state legislature reached an agreement with the striking teachers on Tuesday for a five-percent pay raise. Both houses of the West Virginia state legislature have passed a deal giving teachers and all state employees a five percent raise—one percent more than the Republican state Senate offered the teachers on Saturday. Union leadership called off the strike on Saturday, but when Republicans in the state Senate passed a version of the bill that only included a four-percent pay increase, the strike resumed. According to MSNBC, this was the longest teacher strike in West Virginia state history. West Virginia teachers were among the lowest-paid teachers in country with an average salary of just $45,000, good for the 48th-lowest teachers’ salary in the nation. Writer Barbara Ehrenreich pointed out one of the most illuminating things about this strike and what it says about the current state of education in America.